The sad, sad people who brought you the depressed cat nativity have also aimed their bummer-beam at America’s Greatest Threat: the bear. Same rigor mortis baby, same dog-angels. Perhaps the dogs were mauled by the bears? I don’t know. But I do know that somewhere out there is a nativity designer who really, really needs a hug. This entry was posted in inter-species on December 9, 2007 by admin. Those expressions work just fine for the Crucifixion, but I thought the Nativity was supposed to be happy, or as happy as a woman would be immediately after giving birth in a stable. is this what it means to ‘bear’ a child? 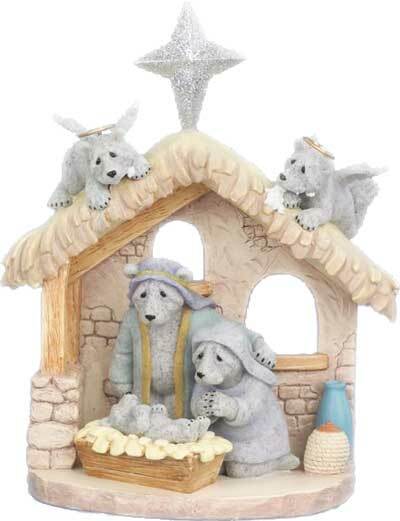 I like flipping between the depressed bears vs. kitties to do the “what’s changed” in this nativity game. Please, oh please, don’t do any more stiffy JC babes- way to sad for my holiday season! Wow, one dead baby Jesus was bad enough. Two dead Baby Jesi are more than I can deal with, even if this IS a penitential season. Either this designer needs a hug, or he/she needs to mainline Prozac. Pronto! But you’ve got to admit the black nail polish on all the species adds a sort of goth hippitude. I just know SOMEONE has a new ankle tat under those robes. Celebratin’ the birth of the Christ child.. Woo? Clearly they are not saving a ton of money on their car insurance..
An American Christian who quotes Stephen Colbert. My faith in humanity is restored. For Christmas. Also, is it me or is Dead Hirsute Jesus lying in a bed of french fries?